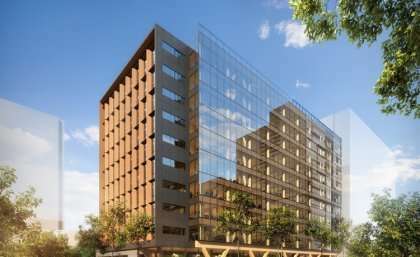 Australia will soon hold the record for the world's tallest timber office building at 5 King St Brisbane, and with the help of The University of Queensland's new research hub, wooden skyscrapers could become the norm. ARC Future Timber Hub (Australian Research Council) which launched today will be Australia's leading timber research collaboration, bringing together experts from industry, government and academia. Structural engineering expert and Hub Director Professor Sritawat Kitipornchai from the Faculty of Engineering, Architecture and Information Technology said the research facility will draw on strong industry support to make significant changes to the building design, materials manufacturing and construction industries. "This Hub represents an opportunity to transform not just our ability to design and construct healthy, resilient, sustainable tall timber buildings; but to engage and transform the entire industry – from the sustainable forests that provide the raw timber, right through to assembling the building safely on site," he said. "The environmental benefits to using timber as a construction material are overwhelmingly positive, with engineered wood acting as a carbon sink instead of producing greenhouse gas emissions like its alternatives, steel and concrete. "Using sustainably managed plantations to produce engineered wood products, and developing prefabricated construction technologies, allows engineers to minimise waste and enhance building quality and performance. "Timber is also a fantastic natural insulator and is a quick and simple material to use in construction." The diverse team will include product manufacturers, construction managers, fire safety engineers, architects, and structural engineers. They aim to develop new wood products that are custom-designed for the Australian context, hybrid (eg. concrete-timber) construction systems and to address fire safety considerations in timber construction. The ARC Industrial Transformation Research Hubs scheme engages Australia's best researchers in issues facing the new industrial economies and training the future workforce. The Hub was founded as an interdisciplinary partnership between the School of Civil Engineering, the Queensland State Government Department of Agriculture and Fisheries, Arup, Hyne Timber, Lend Lease, the Queensland Fire and Emergency Services, Scion NZ, Griffith University, the University of British Columbia and the University of Canterbury.